I got a bit scared seeing this, what would it mean? I’m not sure anymore if I started to work without it. It was my very first job and it was in a German company and now I live abroad, I only remember getting the Rentenversicherung number per post. If I started to work in a German company, have I been automatically assigned a Steuer ID? Unfortunately I can’t contact my old company’s accountant to check that. Hi Rina. No need to get scared. As you an employee, there aren’t any risks of you owing the money to the Finanzamt or something. It just prevents you from recovering the amount you were taxed too muched on(higher tax rate than people with a Steuer ID). It doesn’t mean you can’t do a tax return and it doesn’t mean you won’t get anything back. Rentenversicherung number is something else entirely. Awesome explanation. So I recently figured out I have to do my returns. I’ve been employed so nothing complicated from my side. Except I have some german correspondence from my health insurance about stuff they didn’t file to the taxes. As a result, plus to double check, I would like to fill in my online forms together with a tax return specialist. Does anybody have any tips? I was given a great person that assisted for 99,- per year, but she moved back to UK and has no time. Any tips are welcome. Or would anyone suggest to sign up to a lohnsteuerverein? Lost in woods, any steer on direction is appreciated. This page is of great help ! Thank You ! I have 1 query in the process and it would help immensely if you can guide me with it. What is the difference between ” Joint Assessment” and “Individual assessment for spouses”? I am married and my wife has been unemployed during the whole tax year. What type of assessment should I select in this case?.Please advice. Hi Vijay. If your marriage is official in Germany too, it’s preferable to have a joint tax return because your wife’s low income will decrease the taxes you will pay, and possibly increase the return. Hi, great article so thank you very much. I signed up with smartsteuer but found their customer service (possibility to ask for clarification on questions) very poor. I’m fulltime employed living in Germany since several years. I got married abroad in June 2016 and registered myself as married in Germany in July. My wife moved to Germany a month later. I was advised to enter the date of marriage in my tax declaration as the date recognised by Germany. Do you know if this is the date of marriage abroad or the date of my status change in Germany? Hi Steve. Thanks for your feedback. As a rule, only enter stuff that you can prove later to the Finanzamt. There is a high chance that it will not take into account anything before it was made official in Germany. Congrats for the very helpful page. I have been told that if I can prove that if I can prove that I moved in Berlin because of a job that I got in company here and that I still have residence in another country, I can include even my rent expenses in the tax refund. Hi Mandi. This steuerberater is stating that it could be part of your relocating expenses, which are tax deductible. Maybe worth it to look into it. I am a Citizen of India and worked as an employee in Germany from 1996 until 2012 and moved to India after my retirement. I am not a German resident any more and have no residence in Germany. I am now a resident of India since Sept 2012. I have some shares from a German Company and getting regular dividend. The company is deducting 25% tax and also Solidaritaetssuchlag before remitting the payment. I also had an insurance policy with a German Insurance company and this policy got matured and they deducted the tax of 25% on the capital gain. Can I claim this refund? for how many years can I claim and what is the process? Hello Rakesh. This is a little too complex for my knowledge, especially since it’s about non-work related income. I suggest that you work this out with a Steuerberater directly. Thank you for all this useful information. It’s really helpful and very generous of you. My situation is that I am a Freiberuflerin, a US citizen (so I need to file US federal and state taxes), and I acquired an apartment in 2016. I used a Steuerberater for 2015 who was terrible and I’m thinking of tackling my Steuererklärung this year on my own. I’ve used elstar online, but I wanted to ask if there is an online program worth purchasing that would better handle the complexities of my situation – Freiberuflerin + Vermieter (momentarily). Thanks in advance for any suggestions you might have. Hi, I am a freelance English teacher, I have just moved to Berlin. I teach English online and my main client is based in China and they pay me in US Dollars. Firstly, would I need to pay VAT if I earn over 18000 euros? Secondly, how would the exchange rate be calculated? Thank you for your help. Hi Peter, i would suggest you look into the “Kleinunternehmerregelung” (Small entrepreneur regulation) to see if it applies to your case. I can’t answer this question with so little info. This page might be a good place to start. Exchange rate is calculated at the time of money transfer/exchange. The Finanzamt only cares about the amount of euros you receive on your bank account at that point in time. I moved to Germany from Canada as an employee for a company in July 2016. I have worked here for 5.5 months and am therefore not considered a resident for the tax year (I think). Before moving here in Canada, I was a student and a freelancer with a small income. 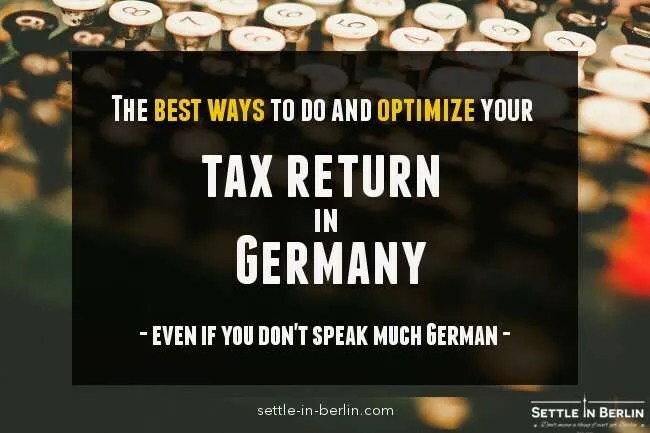 On my German tax forms is there a way to claim more tax back if you were only a resident less than 6 months? Do I have to declare my Canadian freelancing income on my German tax forms despite being a non-resident of Germany at the time? Hi Eric. It all depends if you had a German Tax ID (Steuernummer) while working here or if you were still paid and under contract with the canadian company. If you had one, then you are eligible to a tax return. If you are doing it, there is probably no need to declare your freelancer income but that’s just an opinion as there might be bilateral agreements between Canada & Germany for that. Thank you for your help. This page is pure gold. Great website! Thanks for the helpful tips! Do you know if I can claim the cost of my Steuerberater from last year on my tax declaration this year? I was working as a freelancer from September 2015 until March 2016 and earned minimal income (only 3000 euros). I went to a Steuerberater last March who charged me 600 euros to complete 2 tax returns as a freelancer.. one for 2015 (Sept – Dec) and the other for 2016 (Jan – March). Luckily I didn’t have to pay any tax, but the bill for the Steuerberater was one fifth of my income! Since March 2016 until now I have been working full time as an employee paying monthly taxes. In Australia, we are entitled to claim back our Tax accountant costs as a tax deduction while submitting the tax declaration. Do you know if I can do the same here in Germany? If so, how? Hello Dom. Yes, your Steuerberater can be accounted for as a service provider (Betriebskosten). The bills can be put off in taxes. Hello! Great website, very helpful! I appreciate! Before I ask my question, I`d better elaborate my situation. I am a PhD student in Charite, but I do not receive a regular salary, I get a scholarship (stipendium). When I first started (2015), I went to Finanzamt and got my SteuerID. At that time, I was told I do not need to pay any tax, because i receive only a scholarship. Now I am continuing my PhD, and I am still getting my scholarship (it is a bit higher than the beginning) for two years. Today I got a mail from my Health Insurance company about my “Steuererklärung” which did confuse me. I was thinking that I do not have anything to do with taxes, as I am a student with scholarship who does not pay regular tax. In the mail that my insurance sent me, there are some amounts under the name “Versicherungsbeiträge”. I would be very thankful, if you can give some info or tips regarding my situation. Hi Matteo. You are right: your scholarship is a tax-free income. As for the letter; it’s simply not possible for me to give you any tips because i’d need to see the full letter to answer. I’d suggest that your bring this to work with you so a German speaking person can help you understand it. Sorry i can’t help you further. Hi! I cannot find the answer to the following: I’ve moved to Germany with my husband, who is working here. I’ve kept my work in Norway, working part time from home office. Taxes have been paid to Norway – and I’m quite sure that I shall not pay any taxes to Germany. But the question is: Am I obliged to deliver a Steuererklärung to German authorities? Hello Hilde. Only self-employed people registered in Germany have an obligation to do it, so i don’t think it applies to you. However, make sure to check there is no bilateral agreement between Norway & Germany for this. i am a full-time Masters student in Germany and for the past 1 year I have been working as Student Assistant (MiniJob) at my University. I am in Steuerklasse 1. I am not sure what that means but I have to pay Rentenversicherung and Pflichtversicherung. Can I get a refund? Hi Faz. Full time students can do their tax return too yes. Expenses like text books, computers you bought for your studies can help you get a better tax return. I have one question regarding the tax refund for more than one year at the same time. It happens that i have been working in Berlin for the last few years and i even have my 2014, and 2015 steuerbeschinigung (i guess this is the name, ufff) provided by the firma where i work. I was wondering if there is any chance to submit a request for the refund of those previous years. If so, in this particular situation should i reach a specialist in those matters, or the website you shared allows me to do it? Hey, thanks for the information! I have a question maybe you can give me some hints to clear this out. I have worked in Switzerland for 3 months last year and opened a bank account in Germany (N26) that didn’t require German Anmeldung. I paid taxes in Switzerland, of course, and everything went OK.
Now the company transferred me to Berlin with a new contract in our Berlin office. I did the Anmeldung here and now I will be paying taxes in Germany. My question mainly is regarding my current bank account and the money I have there. Is it possible German authorities will tax me for that? Or I will pay taxes only from the moment I moved to Germany or started my contract here. Hello Federico. Your income was already taxed once in Switzerland so there is no reason to pay for that once again. You will pay taxes on the income you generate in Germany with your new contract. I suggest your keep your swiss tax statements close in the very unlikely case the Finanzamt comes after you. I have a question, I work from January to the end of December 2016 on full time job.. o want to know if am eligible to get tax refund after working for the whole year in Germany. Hi Paplo. The answer in one word: yes. In two words: yes absolutely. Hello im a singaporean student doing Duales Studium n i would like to ask if i can get full refund of my textbooks fee back? I paid 44EUR for the textbks so does that mean they return the whole 44 EUR or juz the Mwst? Hello Nicole. If you have applied for Tax ID, expenses will help you reduce your taxes and if applicable, get some of the amount back. It’s not related to Mwst. Hi, thanks a lot for these info! I have a few doubts. I was working as a freelancer in Germany for a period of 6 months (Jan – June 2016). I returned back to my country in September 2016, and right now I am not in Germany. While I was a freelancer, I have paid the VAT every month using Elsteronline portal, but there are a few bills and receipts I have (like a laptop bill or camera bill which I bought for my work) for which I have deducted the product’s VAT from the VAT and paid only the remaining amount for the respective months. I was told that I have to submit these bills or receipts while I file the year end taxes. I do not expect any tax returns but I have to file my taxes and bills. Can you please advise how to do that using elster or any other website? Hi Ria. I am no expert but it is possible to adjust the total amount of VAT owed/due for the year when filing your tax statement with the “Ust 2A” Anlage i believe. All this tax stuff is confusing, maybe you can help me. I was registered as a resident in Berlin from end of May till end of August 2016. I worked here for the summer (with a completely normal regular contract). In September I went back to my home country (EU) to continue my university studies and that’s where I am till this day. So do I have to file the tax return papers/can I get a tax return if I no longer live in Germany (am no longer registered here)? Hi Nele. You should check if there are any agreements between your home country and Germany on this. (More info here). If you were registered and paid taxes, you should be able to get it back but i’m not sure if the Finanzamt can process a unregistered foreign address. Maybe this article can help. It is nice to find some informations in english! I am in Germany for six months (october to march), and according to the bilateral fiscal agreements between France and Germany (a document called “Doppelbesteurungsabkommen”), I must pay the tax on my whole income in France, and only in France. Unfortunately, the tax on the income is automatically taken from the salary in Germany, and I do not find a way to obtain a refund. One colleague has advised me to complete a “steuererklärung” (which has led me to this website), but it seems it would only update my tax, under the assumption that my income is taxed in Germany, which is not the case. What must I do? Thanks in advance. Hi Anthony, there is probably some document you can fill in for your case. It’s maybe better to get in touch with a Steuerberater at this point. This gets a bit too technical. Thanks a lot for all the useful info. Do you by any chance have now more info on this. I have similar situation, worked half year in Germany and now moved to another EU country. Since I am no longer registered in Germany, can I sent my tax return form with my new address? Hi Francesco, yes. If you are in Europe, the SEPA details are making this even easier. I am a little late filing my 2015 German tax return but am confused. I am a full time student, and worked a part time student job from May 2015 to Mid-September 2015. Then on October 1 I moved to Austria for the second year of my Masters. I have kept my job in germany, working part time remotely. But my company said I only need to file a return for the period I lived in Germany (so excluding October, November, December). they are still deducting pension from my salary but not German tax since I’m in Austria now. My old work contract expired when I left and I signed a new one to cover my time n Austria. So to file my return, do I just do it for the months I was living and working in germany? Thank you for any advice you can provide – I am very confused! Hi Sarah. this is my opinion only and a not a qualified advice (I’m no Steuerberater): Just follow where the taxes went for each contract period, whenever it went to Germany, this is when you can claim it back. Hi Srinivas. Whether you are a student or not doesn’t change what taxes apply to you or not. However, more expenses can be deducted like any books, material or software you bought for Uni, course fees or even rent expenses (up to a point) can help to reduce your income tax and get more money back. I’m a Portuguese citizen living in Berlin. I think my questions are quite easy. I can’t afford a fee from a Steuerberater. I hope someone could help me on this matter. I’m a full-time employee​ paying my monthly taxes but now I have the opportunity to work also as freelancer/working from home. I’m not registered as freelancer. Upwork requires all non-U.S. persons must provide their W-8BEN tax information. I filled this document confirming that I’m not a U.S. citizen/person. Here is my major doubt: Do I need to register myself as freelancer working from this platform? Do I need to report income from here? Please, let me know if someone can advise me on this matter. Hi Pedro. Yes, you should probably register as you need to have this income taxed in Germany, as any other income you might have. I am a student. I had worked as Holiday worker at Daimler for from 15 oct 2015 until 7 th Nov 2015. Tax class 6 was taken as default by Daimler and I ended up paying 600 euros as Lohnsteur. which I thought would be refunded once claim for it. I started working as intern in airbus from 15th Nov 2015. when I claimed for tax return I did not get anything back. They just sent me a letter with no refund. Is it possible to go again this year and discuss about what happened last year ??? Hi Sathish. It is always possible to ask for your Finanzamt to re-examine your case if you disagree with the outcome. However, you can do that only within 4 weeks after receiving your first Steuerbescheid. More info this way (in German). Good luck with this. Hi, thank you for the information. I am a student herein Germany and going to complete my education soon. I have been working as a student in a (19 hours per week) job since August, 2011. My average salary is around 1000 euros per month. Please let me know if I am eligible for tax refund, and if yes, how much refund money could I expect. Thanks again! Hi David. Glad it could help. You are eligible yes, and as a student, there are a number of expenses you can put off in taxes. It won’t a massive refund compared to full-time employees but still interesting to do your tax return. How much exactly i can’t tell you. I have a small income from Portugal (PT). I pay income tax in PT for it but it will affects the progressive German income tax rate. I will file the tax return as married since my wife’s salary in PT is much lower than mine. Is there any paid software with a “clever” questionnaire prepared for my specific case or should I go directly through ELSTERonline? I am trying to get some info about Taxman, SteuerSparErklärung and Smartsteuer. BTW my previous tax return has been submitted by a very well known/expensive multinational company and looks I could find a couple of errors (law misinterpretations). I want to do it by myself. I am still learning German, don’t have any education in law but I am an Engineer, and it makes the difference :). I went to the Income Tax Act (Einkommensteuergesetz – EStG) and was able to rebut a couple of wrong assumptions from my tax adviser (company). Hi Paulo. Have you checked SteuerGo? Their questionnaire is in English, which might help to get things right. I am going to give it a try and also thank you for your work in this blog. Dear Paulo, I have teh same status like you. Maybe we can work togheter to find out more information and to be able to complete one correct Declaration of Income. Please let me know if you are interested. Have a great day! From September 2015 to 2016 I did my MBA in Germany. Therefore I was a student and non-employed. I transferred the cost of MBA from home. Starting February 2017 I am officially employed. My question is how can I claim back on tax deduction my education. Should i do it for 2016, however I was not employed and incurred only expenses. Or can I wait for the end of 2017? Hi Ilona. Check this again but i remember by Steuerberater saying that you can claim those expenses back up to 4 years after you are done with your studies. Doing it in 2017 should be fine. I started working in germany last year 2015 in may. I started with tax class 1. Few months later when my wife arrived we changed to tax class V-III. I have not done my first tax declaration since then and we are finishing 2016. How should I do the tax refund claim, am I still allowed? I never got letters from Finanzamt. Do I need to present 2 declarations, 1 for me 1 for my wife? Or is there a combined one. She has just worked 3 months in a midi job. The rest of the time she has been unemployed learning german. I moved to germany in september 2016 and my tax class was 6. I registered online and it was updated to 1 in December in the Eister process. But in my December salary slip it is still showing 6. Please suggest if it is possible to get the refund back and how. Hi Kunal. It it possible that the update will apply only from January on, as i don’t think they account for single days in their calculation. In 2016, you will have been class 6, and from 2017; class 1. Hi I am new in Berlin. I have registered at the Bürgeramt. How do i get my tax number? Also I have worked one month already and I have been charged a high rate of tax. How do i claim it back? I am leaving my job because they wont pay me overtime hours that the regard as being mandatory. Will this effect me claiming back the tax? Sorry it is a bit of a complicated situation. Hi Cindy, regarding your first question, you can go to the dedicated page here. You can claim this back in 2017 when doing your Steuererklärung for 2016, provided you make sure all is in order with the Finanzamt with your tax ID. I haven t registered at the burgeramt yet so I got the higher rate of Tax on my first pay slip, today. Can I claim a refund for the extra money I paid? Hi Veronica. You will be able to claim it back in 2017 when doing your german tax statement for 2016. Even though it s my fault since I haven t done the anmeldung yet?thanks! Hey, I am student here in Germany? What do I get tax refund on? Do I get tax refund on food and clothing? Hi Ahsan. I cannot reply in details to this question as i don’t know if you have a job, if you are married, have kids, your insurances, etc. It all depends on your situation. However, you cannot get tax refund on food and clothing. Tuition fees can however be deducted in taxes. I started living in Germany since Aug 2014. My fist job, which is as a student worker (60h/month) at company “A” was for 6 months from Apr 2015 to Sept 2015. Then I started working again as a student worker (60h/m) at University ‘B” from Nov 2015 till July 2016. From Aug 2016, I started working fulltime at University “B”. My question is do I have to file a tax return on my own for 2015? Would I get a refund for those period till Dec 2015? Absolutely Klaus. Also don’t forget that any university fees can be put into your tax statement. Hello Faraz. I guess you will need to request a copy of that letter to the Finanzamt. They will probably send it to you by post. I have a different address on my steuerbescheinigung than my registered address at rathaus. Will this affect my tax return? Hi Syna, you change adress you should notify both the Bürgeramt & the Finanzamt (Ummeldung). If you have done those 2 things, you can send your tax return. If not, make sure all Amter have the right address before sending it in. Heyhey! Thanks for the post! Im planning to buy a new iPhone. I got a Blue Card from Germany and working in Berlin for 4 months as a mobile software engineer in a company. So, can I get a reimbursement for the phone which is kind of necessary for my work? Or maybe just tax refund of it? If we are still speaking about the German system, you can do by installments over 5 years. Source. Hello, I’m an employee. I started work in Germany in oct.2015. On all pay checks (oct/nov/dec) I paid roughly around 40% tax. However the earnings for that period are below the taxable amount in Germany. So I should be able to claim that back rite? I registered for Elster, so I can fill everything out online, or do I still have to print stuff off? many thanks for all the good tips! Hi Morven. You won’t be able to claim all of it back but since you started a new job in 2015, you will certainly get a few hundred euros back for sure. Be sure to add all costs you had last year, that you can put off in taxes. When you register for Elster, you need an extra-step to be able NOT to send a paper copy as well. This is a certificate which requires you have a special password sent to you by post. You will find more details on the website. Hi, I am paid from the UK but pay taxes in Germany. Since I received my prepayment tax statement at the start of the year, the GBP has weakened considerably. This means that I pay a much larger amount of tax in GBP than I should be. Will the exchange rate be considered in a tax return in January? And recalculated accordingly? Which exchange rate will they use? I am afraid this a bit out of my league and you might have to go to a specialist for a proper answer. I don’t even know where you should pay income tax to start with. Since your employer is the UK, how does it pay the taxes to Germany? I recently started working here and have been placed into Tax Class 6 – 41% roughly. Now I’m not registered but when I do register I’ve been told that I can claim back that difference between my appropriate tax class 1 and the one I was charge at (Class 6) and I wouldn’t have to wait til it’s time to lodge your tax again, is this true and could you shed any light/point me in the right direction for this as it works out to be a fair bit of money I’ve missed out on. This means that you receive money from multiple employers. Is that true? You should be class 1 if you are single and with only one employer. More info here and about the switch process here. Hi there! I’ve checked how much tax return I’d get and it seems I would need to pay around 100e MORE for 4 years I’m working in Germany! Can this be true? I’m working since 2012 and didn’t do any tax clearing so far. Only for 2015 I would get around 100e, but then for 2012,2013 & 2014 I’d need to pay more. Are you maybe talking about Steuerberater fees? If so then it would be no surprise to pay that amount for 4 years together. The Steuerberater can tell you in advance roughly how much you’d get back in your first meeting. You can then decide if it’s worth it or not. You can also use online solutions like the one mentioned in the article. They usually tell you how much you’d get back before paying anything. Hi all, I have used the online-tool http://www.smartsteuer.de for my tax declaration. It’s easy. I went to the Finanzamt to ask for a deadline extension of May 31 but the employee told me that there is no need for extension and I have 4 years to submit the Steuererklärung, is that correct? Are you a freelancer or employee ? i have a question. i submitted today the tax statement but i found out that i missed to add a couple of items. is there a way that i can submit an amendment or withdraw the application? Thanks a lot, this is incredibly useful. Is May 31 the deadline for Steuererklaerung? Yes it is, but you can ask an additional delay at the Finanzamt if you need. How much important is, when you are giving the tax refund papers, to tell from which exact month I am employed in German company? Because I just forgot to tell the lady that I am working from 1. Juni 2015. and not the whole year. Is that a problem and should i go back and clarify that?? They will look at your Lohnsteuerbescheinigung for 2015 and calculate your tax return based on that. They won’t look at dates. It’s been updated now. The linksare only valid for one session, that’s why you saw an error. This way. Hi, Can anyone rcommend a tax advisor here in Berlin who is familiar with how American income etc. is taxed in Germany? We just moved here a few months ago and are currently living mostly off of our savings that we have in the U.S. Consequently we will need help with how this impacts paying German taxes etc. Any names or tips are very much appreciated, thanks in advance. Really nice page, thanks! I have two questions though..
– How do I do to declare taxes for previous years? There is´a field that asks your “Beruf”. Maybe add it there ? I’m sorry i was never a student in Germany so i wouldn’t know. Maybe this link helps too? If you want to declare taxes for previous years, simply download the forms for the previous years and fill them in. It works up to 4 years prior. Great step-by-step instructions, thanks! The links don’t work, but since you also mention the name of the docs, it doesn’t really matter! Good piece of advice !